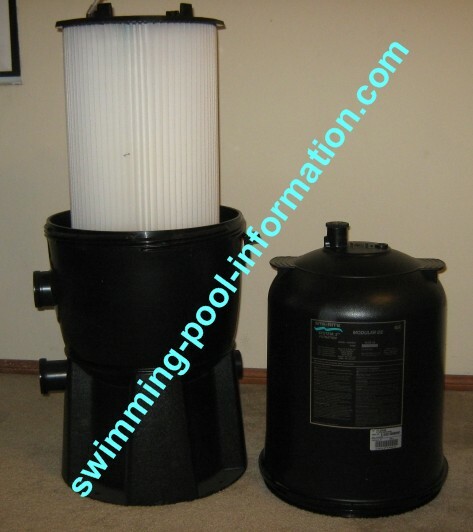 The filter below is a Pentair bottom manifold filter with a fiberglass tank. 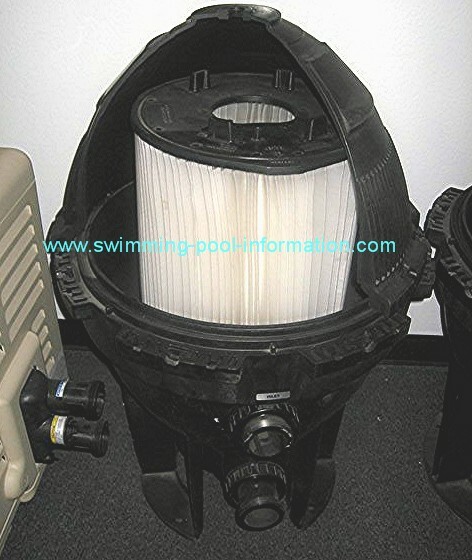 A good filter favored by many pool techs. 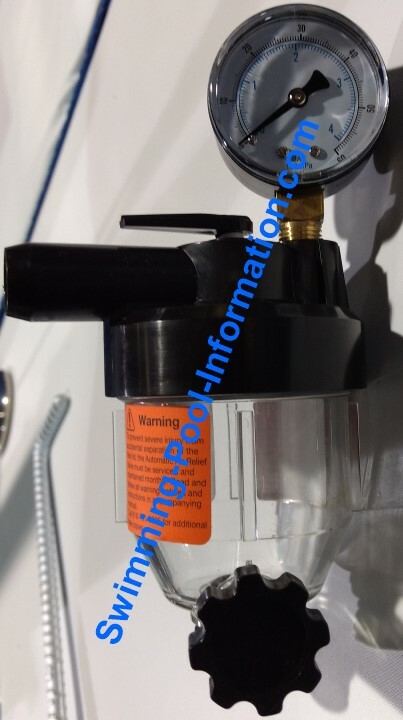 1)The cartridge is very easy to clean,there is no manifold or center rod to take apart...just lift the cartridge out of the tank and hose it off. The cartridge is covered with the same type of material as the grid on the filter at the top of this page but thicker. (I have installed some that are going on their 12th year[as of July 2016]). 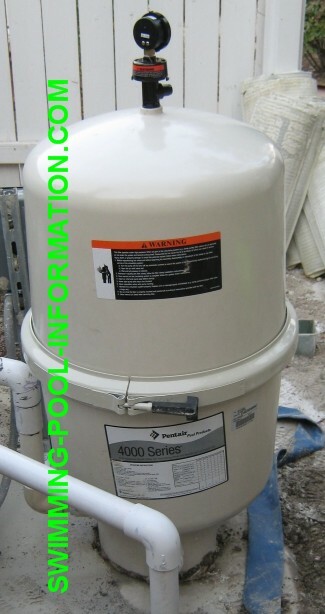 2)The composite tank holds up to harsh chemicals and sunlight and has a 10 year warranty (but its best to shade or cover ANY non metal pool equipment from sun...also, its much easier to assemble than composite tanks that have a wrap-around clamp. 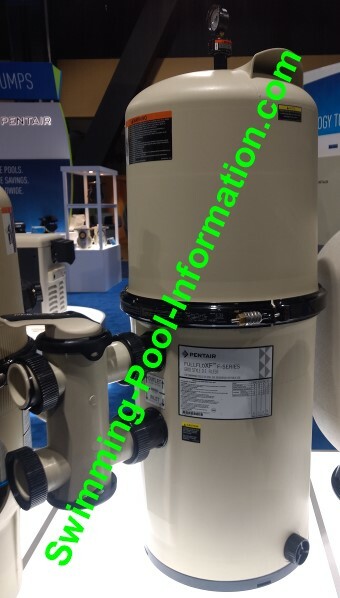 (UPDATE:since Sta Rite was bought out by Pentair Pool Products,all Sta Rite filters now have a one year warranty-but it IS still the same tank). 3)The tank o-ring is impregnated with Teflon and is self lubricating,no messy lube and rag needed. 4)The tank is very easy to take apart/reassemble once the 7 clamps have been taken apart. 1)Service techs love this filter!The simple ring lock is easier than the 7 clamps to remove and cleaning is even easier than the System 3 filter. 2)This filter is less expensive than the System 3 filter. 3)It can fit into small areas where a bigger filter cannot. 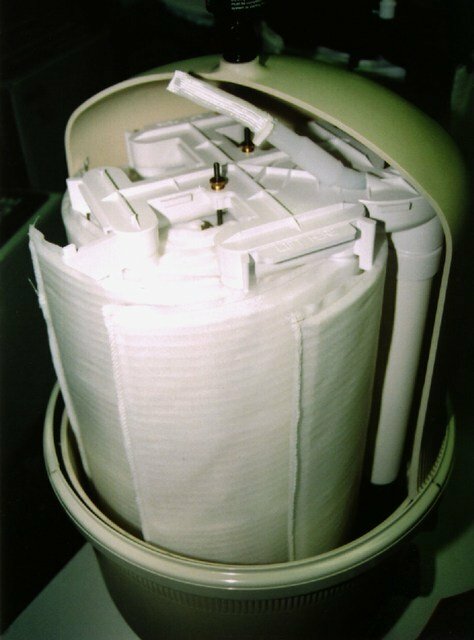 1)The tank is plastic instead of composite like the system 3 filter. 2)The maximum size is 48 square feet of filter area.The System 3 maximum size is 72 square feet.